Only if you're tough enough! While the course is not significantly technical, it is a 100 km of off road 4×4 tracks and stock tracks whose surfaces vary greatly. Riders must be comfortable crossing rivers with their bikes as they will have 5 main river crossings and 7 smaller river crossings as well as various creeks. Entry limited to 300. Earlybird entry now open – save 20% until end of Jul. Wed 20th Dec is the cutoff for entries if you want one of our engraved competitors dog whistles, as well as personalised number plate and other goodies in your registration bag. Whistles in particular need to be ordered now due to christmas holiday closures, so get in now or you will miss out. The “James” Epic is an R16+ Open Range event – there are no age group categories. The race will start at 8:30am (race briefing 8:15am) from the Lake Tennyson car park area and follow the 4×4 track (think “Dual Single Track” – DST) to the top of Malings Pass, from where riders can enjoy a solid 5km downhill descent to the Waiau River. From here the DST crosses the river and continues for a couple of km down the Waiau valley toward the historic Ada homestead. About half way toward the homestead at Matagouri Point, they will re-cross the Waiau and complete a loop out around Lake Guyon to the Stanley Vale and back, to complete their 3rd crossing of the Waiau, to rejoin the DST. Following the DST around below the homestead, riders will then travel up the Ada valley to a point around the confluence of the Ada and Christopher rivers, before riding back down the valley to cross the lower Ada flat and Ada River to enter the lower Henry valley. Travelling up the Henry, riders will complete their final in-out loop, riding up the Henry to the old Anne hut site, before returning back down the valley, where they will then cross the Henry River for the 3rd and final time. From here riders follow the main stock track down the Waiau and across the (lower) swing-bridge. 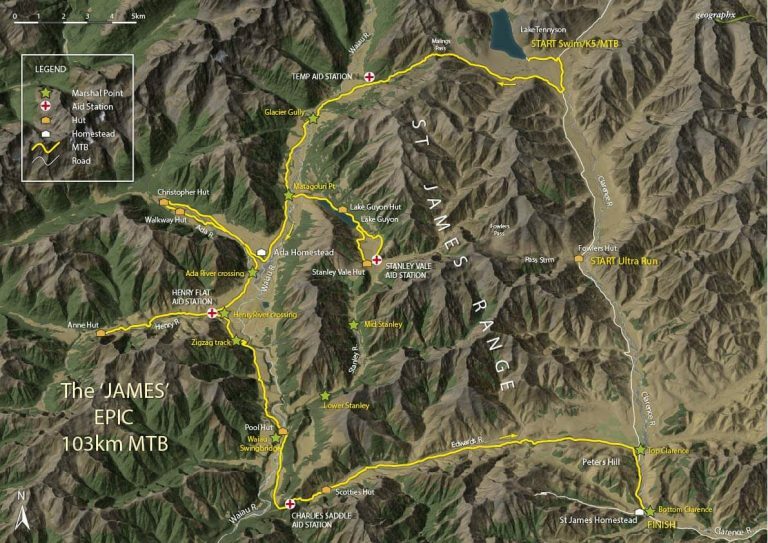 Joining the DST, riders will climb up the Waiau terraces and up over Charlie’s saddle to head up the Edwards valley to exit out through the Edwards gate onto the Clarence road. From here riders will follow the road back to the finish at St James homestead. Competitors can expect very hot conditions – be prepared and stay adequately hydrated. There will be marshal stations at various points (including three major stations on the MTB stage, with EM’s goodies, R-Line, water, banana’s, sunscreen & crampstop) but this is remote country so all competitors will need to be self-sufficient – all rivers & creeks should be ok to drink from directly. You will come through transition twice on the run. Spot GPS trackers are highly recommended – These are live trackers (as well as a PLB) so all your mates can watch your progress online at home. Book yours at checkout. All competitors will be required to carry a minimum amount of safety/emergency gear – it can go from hot sun to heavy snow in a matter of hours even in the height of summer. By preference race organisers require all riders to use hydration packs and not water bottles – these are too often lost/dropped from bikes and left on the track. As with any littering any competitor caught dropping rubbish will be intantly disqualified.